Yes – Yay, he’s out. Cue cut scene. Yes, But – Ok, he’s out of the Vault but something unforeseen happens: he’s attacked by giant rats (that’s the but). Now he’s got a whole new set of challenges: fight the rats. No – Darn it, he’s stuck in the Vault. Do over. The player has to retrace their steps and try some other form of problem solving. No, And – Darn it, he’s stuck in the Vault – AND the ceiling is collapsing, LOOK OUT!!!! You see, each time you answer the question “Does the player succeed” you change the plot. In the example above you’ve got a single plot thread: Get out of the Vault. When we answer Yes, we simply end that plot thread. Snip – gone. The plot ends. If we answer “Yes, But” we end that plot thread and start another (“Whoa, those rats look nasty.”). The plot continues with a new set of goals. Answer it with a “No” and it’s a slap in the face. 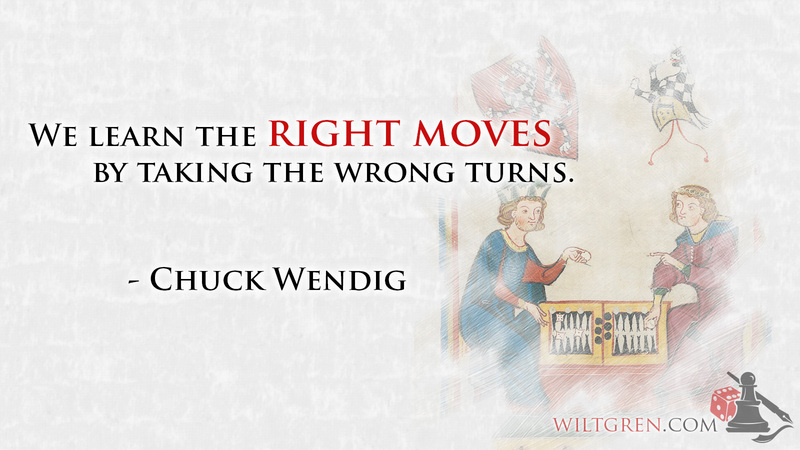 The player has flubbed her rolls or failed her reasoning, the problem remains and now the player has to backtrack and find where she went wrong. The plot remains unchanged. Answer our question with a “No, And” and the player not only flubbed the roll but she did something catastrophic (or something catastrophic happened) – Help, the Vault is collapsing. We’ve added another plot thread and now the player has to solve two problems. The player will focus on the Yes. That’s where their goal is, they want to get out of the Vault, save the princess, escape Inigo Montoya. But if they succeed then there’s no more game. Do we kill the bad guys? Yes. Ok, now what? Every time you answer the question with a Yes you need to make sure that you’ve got another plot thread already in place and running or else you’re lowering the amount of things that the player can do. In a shooter that’s fine (kill the level boss, BOOM, on to the next world) but in an adventure game it’s not (kill Dracula, all the vampires are dying, we’re stuck in Transylvania roasting marsh mallows and singing camp carols). Success simply isn’t all that interesting. Thus when you’re working with Yes answers you’re pruning your plot tree. You’re cutting it back, killing off side quests and streamlining the story for the final confrontation. If you start doing this too quickly you’ll end up with a linear, boring game, a one thread hack-and-slash with no player volition. But if you start doing this at the right moment, say during the last 5% or 30 minutes of the game, whichever is shorter, you end up with a grand finale. Think about it: you’re collecting all of your plot threads into a single, grand culmination. You find the Sword of Evil Slaying, you quaff the Potion of Awesomeness, you boost your power, tweak your tweaks, and now what? Go back and start leveling some more? No! You want to get to the Crack of Doom and go head to head with Mr. Evil, Shining Eyeball himself. And if you do, get the timing of your yeses right you should be able to get to the point where the player feels that she races to complete all of their secondary quests before the grand Time Bomb goes off and the boss appears. Big, climactic fight, end credits, Dude, you’ve got to play this awesome game. Ok, there’s a secondary use of the Yes answer: it gives players a breather. Do we make it to Rivendel? Yes. Ok, now we get to dance around with the elves while we figure what shining blade to equip our secondary archer with. All armored up, let’s roll. But if you don’t need a breather, or worse, if you insert one by mistake, your players will grow bored. Resolves and ends plot lines. Save it for the final parts of the game. Tie in as many yes’ as you can in the last 5 % / 30 minutes of game play (whichever is less). This will create a powerful feeling of resolution. Danger: once the resolutions start coming the game runs out of things to do fast. Ok, so you can’t just let players resolve all of the plot threads. Thus we go to the next level of resolution: Yes, But. In Yes, But the original plot thread is resolved, but a new one is added. Do we kill the level boss? Yes, BUT we go to an entirely new world and have to start over again. Yes, But works like tying a number of ropes together. This is the staple of quite a lot of adventure games and platformers. Using Yes, But gives you a very slim decision tree: you’re pruning as you go, so to speak. The down side is that you give your game a very episodic feeling and this will destroy any attempts at creating an epic scope to your game. If you want an epic scope you’ll need to avoid clean breaks. One way is to have several plot threads running simultaneously and replace them only one at a time. Unfortunately players aren’t dumb. 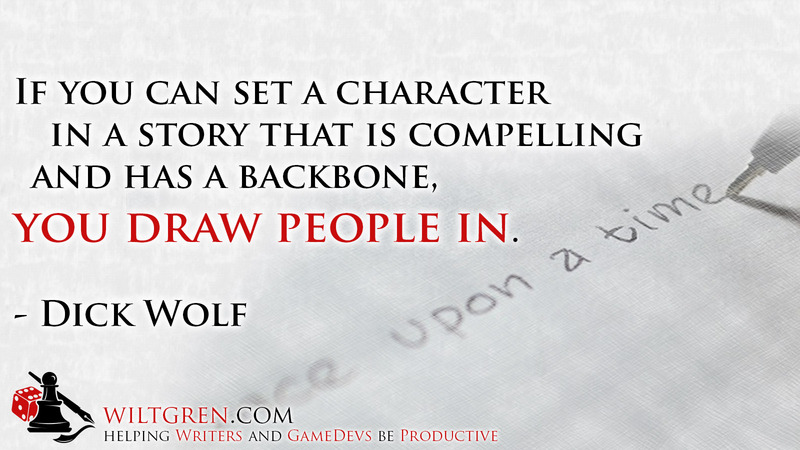 They’ll catch up to what you’re doing so you’ll need to keep some plot threads running the length of your game. In fact, if you tie of all of your starting plot threads there will be a definite feeling that the game has a beginning that is separate from your end, even if you replace your plot threads with a “Yes, But”. Thus, use Yes, But, but don’t overuse it. Ends a plot line but starts another, basically it replaces one quest with another. Gives a sense of satisfaction without making the overall game feel smaller. Retains the number of objectives available. Too many Yes, Buts make the game choppy. Requires that the player learn a new set of objectives, characters etc. 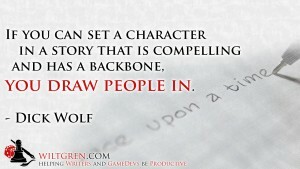 Makes the game more shallow by creating many short plot arcs instead of one giant one. This leads us to the next point: No. No is boring. No is a failure. No is you shafting your players in the back. Do we climb out of the pit? No. Do we jump out of the pit? No. Do we dig our way out using this broken mouse bone? Maybe. No is the equivalent of your players being eaten by a Grue. It ends whatever they were trying to do without giving them anything else to do. It’s basically failure of the worst kind. On a side note, this is fine in books and movies. Passive entertainment is often a string of Nos tied together with a bunch of “No, Ands” and the odd “Yes, But”. That’s because watching someone succeed is boring (ok, it can be done, just look at Forest Gump, but it’s hard to pull off). Watching someone think up of the most clever solution they can and then fail, that’s exciting. Doing it is horrible and frustrating. If you, as a player, think up a clever solution you should be rewarded for it. Having it smacked down because the designers didn’t consider it is grating. Having it smacked down because the designers considered it and decided that the game would be too short if you’d succeed is grounds for summary destruction of the game and angry letters to every reviewer in the world. Which leads us to the solution: No, And. Signifies that the player has done something wrong. Danger: Common in writing but boring in games. No, And is the “I grabbed the flame thrower but the monster’s immune and now my space ship is on fire.” No, And creates new problems without resolving the old ones. We tried our smart solution but, Yikes!, we’ve drowned the cat/dropped lard on the princess/unleashed the dogs of war. In a novel this is punishing the hero. Strangely enough, in a game this is rewarding the player: yes, we see the clever thing you’ve thought up but – booyah! – we thought it up too and here’s a giant piranha to eat you! No, And not only confirms that the player’s actions are basically sound, but it gives the players something more to do (as opposed to No, which just says “fail”). It rewards action (even failed action) with more opportunities for action. Of course, a No, And creates another plot thread. It puts you as a designer into a bind – you’ll have to resolve those Ands somehow. Create too many of them and you’ll have the player being chased by everything from squirrels to killer tomatoes and wondering how in the world the game will resolve this. And those loose Ands will interact, or should interact or the player should be given to understand why they don’t interact (no, the Rebels and the Empire won’t collaborate to catch you because they hate each other more than they hate you). If you just leave them going bump in the night you’ll end up with the Pacman dragging an endless tail of ghosts after him. Another thing to consider is that a No, And should never be arbitrary. 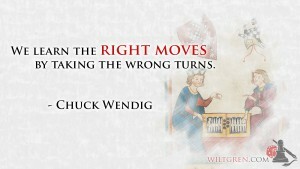 It should always be an effect of player action or inaction or else the game is playing the player. Note that I did say inaction here: “you spent your nights drinking and whoring in Brie instead of going to Rivendel so now the Shire is burnt and all the nice, little Hobbits are dead” is quite a valid No, And as it depends on player choice. “You went to Rivendel and all the Hobbits are dead” is just plain sloppy plotting (unless you’ve foreshadowed that no matter how hard the player tries the Hobbits are basically doomed – but then, why should the player even try?). But before you go off creating all the cool No, Ands in the world, consider that there has to be a plot reason for the new thread as well. “We went to the old guy and he refused to tell us because the designer wants a side quest here” is bad plotting. “We went to the old guy and he refuses to tell us because the bad guys got to his daughter and she will be killed if he helps us” is a valid plot reason to start a side quest (“hey, greybeard, here’s your kid, now where’s the Potion of Awesomeness?”). Both give the exactly same effect but the second one has a reason, and when dealing with plot, reason is all you need. Shouldn’t every feel arbitrary – should be the effect of player actions. Kills a players attempt at problem solving stone dead – and replaces it with further problems. Can be very powerful if used right. 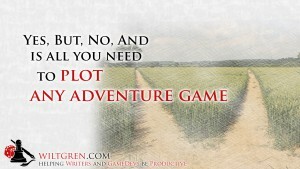 Ok, now you’ve got all the points you need to plot, or analyze, your adventure game. Is your game now finished? No, And this post is. This post previously appeared on Wiltgren.com - Helping Writers and GameDevs be Productive. New updates every Monday.